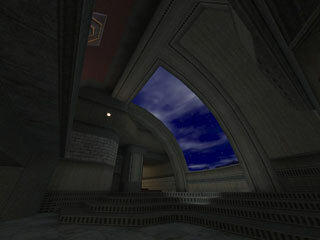 Description: A CTF map built with the ikbase and Sock's egyptian texturesets, focused on versatile connectivity, movement, and nifty lighting. This map is designed for the Team Fortress Classic modification. A couple of notes on other "non-standard" aspects of the map. makes you more resilient against explosions. * Similarly, the rock room respawn provides shell-resistant armor. * Respawns do not give you health. This is an intentional decision. * The water entrance resupply bag can be used by either team. "long shoop." The long shoop only works in one direction for each team. The underground shoop provides invincibility while you're inside it. sirVIPER, for pestering me to finish for all these years. MooN, for pestering me to finish for all these months. helped provide motivation for this one. The QMap people, whose examples provided a wonderful model to emulate.